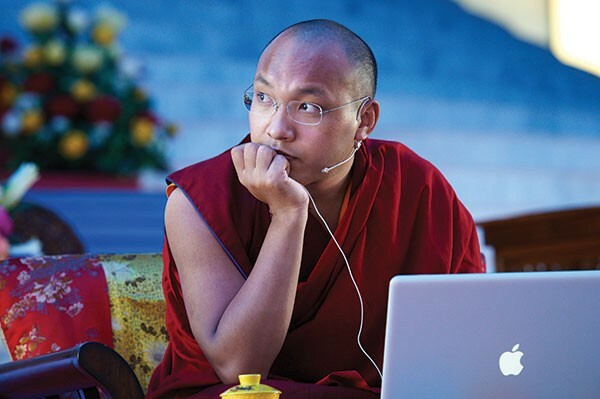 His Holiness the 17th Karmapa works on his laptop at the Kagyu Monlam Pavilion in Bodgaya, India. If an enthusiastic friend raves about "the 17th Karmapa" and you think it's the title of the next Star Wars sequel or an early Bob Dylan song, you should know this: The man his followers call the Gyalwa Karmapa is the 29-year-old leader of a major school of Tibetan Buddhism and of the Karma Triyana Dharmachakra (KTD) monastery and shrine in Woodstock, which was founded by his predecessor, the 16th Karmapa, in the 1970s. The Karmapa feels an affinity with America and is interested in the modern world and such issues as the environment, social justice, and gender, according to his supporters. He's now on his third tour of the United States and, among many other appearances across the country, will speak on "The Relevance of Genuine Compassion" at UPAC in Kingston on April 18. Lama Kathy Wesley, communications director of KTD, says that when the Karmapa—who is particularly popular with college students—visits the country this time, his lectures and teachings will focus not only on meditation and karma, but will also demonstrate a new practicality. "He began as a young teacher talking about philosophy, but quickly he began to teach about how to practice love and compassion even with people you find difficult," Wesley says. "His teachings contain practical ways of developing and practicing love. It's something we all have to practice." This is after the Karmapa spent many years studying the basic tenets of Buddhism, Wesley says. "Since the Karmapa arrived in India [from his home in Tibet] in 2000, he's really spent a lot of time deeply studying Buddhism with his teachers. When he teaches today he is manifesting the benefits of all those years of study and meditation," she says. The Karmapa has visited the United States twice before, in 2008 and 2011, invited by KTD and other Buddhist centers around the country. This time he'll give public lectures at prestigious venues including Stanford, Yale, and Princeton Universities. "Everybody is looking for his guidance. There must be something going on between him and youth," KTD President Tenzin Chonyi says. "Many college students from different parts of the United States are coming to India, and every year US students visit him, interact with him. College kids are very much into him." Chonyi says he has served the Karmapa throughout his life. He relates how the 16th Karmapa visited the United States in 1974 (he died in 1981) and asked his followers to found a center for his teachings. When they sent the Karmapa pictures of different sites, he selected the one in Woodstock. Chonyi says the 17th Karmapa's visit is an exciting occasion because his teachings manifest the energy and activity of "one thousand Buddhas combined into one. There is total energy of loving kindness and compassion—not in the ordinary sense, but compassion with wisdom, beyond ego, selfless," he says. Wesley says one only has to look at the title of the Karmapa's book, The Heart Is Noble, to begin to understand his philosophy. "For Buddhists, people have a basic goodness, but they develop so many habits that get in the way of being able to live out their noble heart," she says. "The practice of mindfulness and conscious compassion [such as the Karmapa teaches] are ways we can actualize and nurture the basic noble human heart." The Karmapa will offer a Bestowal of Refuge Vow and teaching on "The Development of Genuine Compassion" from 10am to noon and from 3pm to 5 pm on April 18 at UPAC in Kingston. 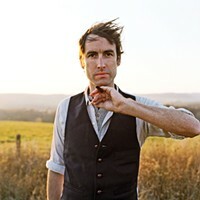 Ticket prices range from $30 to $180, and at press time not many were left. For tickets and more information: office@kagyu.org or Ticketmaster.